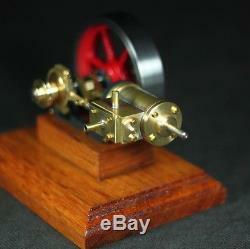 Premilled material kit Model steam engine "Danni". 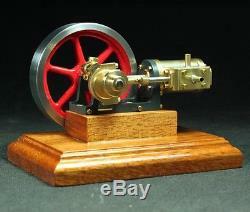 The stationary steam engine "Danni" model includes a sturdy frame to which the dual action steam cylinder attaches. The steam engine's cylinder is controlled by a cam and a round valve. This compact yet powerful steam engine is great for steam boiler operation but can also be operated by compressor. Careful fabrication of this assembly and without load the engine will already start at 0.1bar. The steam engine's plan and construction manual are very extensive, detailed and written to be easy to follow. 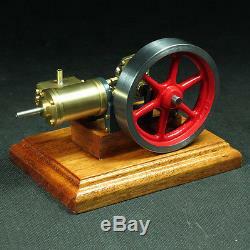 The model steam engine's cylinder is brass, the piston bronze. Plungers and valves are made from stainless steel, the flywheel is cast iron. 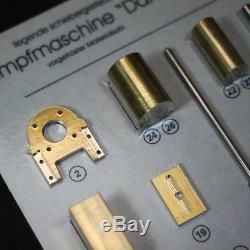 All remaining parts, as customary for steam model making, are brass. Building the material kit for the "Danni" steam engine only require a few tools. A small lathe and a small power drill will do. Your lathe should be large enough to overwind the outside of an 80mm flywheel. You should also have a gas torch for soft soldering larger parts. You will also need M2 and M3 screw taps and M2 and M3 threading dies, reamers 4H7, 6H7, files and a drill bit set. Base plate: 140mm x 100mm. The item "Model steam engine Danni premilled material kit" is in sale since Thursday, July 21, 2016. This item is in the category "Toys & Games\Steam". The seller is "bengs-modellbau" and is located in Bückeburg. This item can be shipped worldwide.